Food vacuoles arise from the single membrane that lines the cytopharynx. 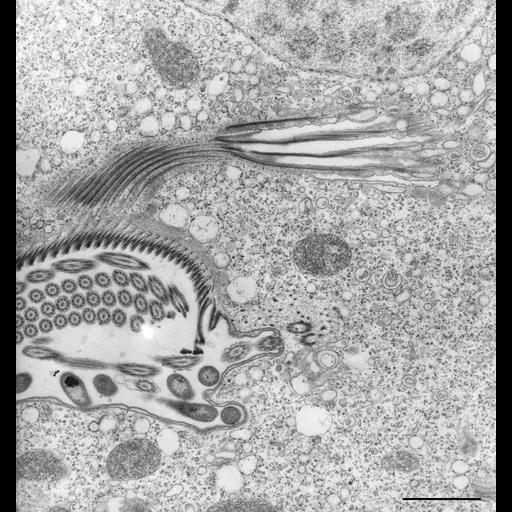 Vesicles, similar to discoidal vesicles, attach to the cytopharyngeal microtubules (lamellar clumps) that arise from the dorsal ribbed wall of the peristome and that pass beyond the cytosome. The cytopharynx swells and a food vacuole balloons out through the ribs that are produced by the folded cytopharyngeal membrane and the attached lamellae. How, why and when a food vacuole pinches off needs further study. A myoneme equivalent to the cytostomal cord in Paramecium lies along the origins of the lamellae (called cytopharyngeal ribbons in Paramecium). TEM taken on 3/30/71 by R. Allen with Hitachi HU11A operating at 75kV. Mag. 9,250X. Bar = 1µm. The negative was printed to paper and the image was scanned to Photoshop. This digitized image is available for qualitative analysis. There is a high resolution version of this image in the library (CIL:39463) which is available for quantitative analysis. Additional information available at (http://www5.pbrc.hawaii.edu/allen/).